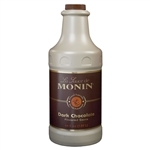 Monin Dark Chocolate Sauce - 64 Oz. Agave Nectar Organic - 1 Ltr. Monin Guava Syrup - 1 Ltr. Lime Syrup - 1 Ltr. Flavor Sugar Free Sweetener Unflavored - 1 Ltr. White Chocolate Sauce - 64 Fl. Oz. Caramel Sauce - 64 Fl. Oz. Monins O Free Raspberry Syrup - 1 Ltr. Toasted Marshmallow Syrup - 1 Ltr. Pumps Plastic Bottle - 1 Ltr. Monins O Free Peach Syrup - 1 Ltr. Pina Colada Smoothie - 46 Oz. Wildberry Fruit Smoothie Mix - 46 oz. Mango Fruit Smoothie Mix - 46 Oz. Monin Dark Chocolate Sauce - 12 Oz. Frosted Mint Syrup - 1 Ltr. Cucumber Syrup - 1 Ltr.